YOUR PREMIER SOURCE FOR RARE GERMAN SIG SAUER PISTOLS & PARTS! 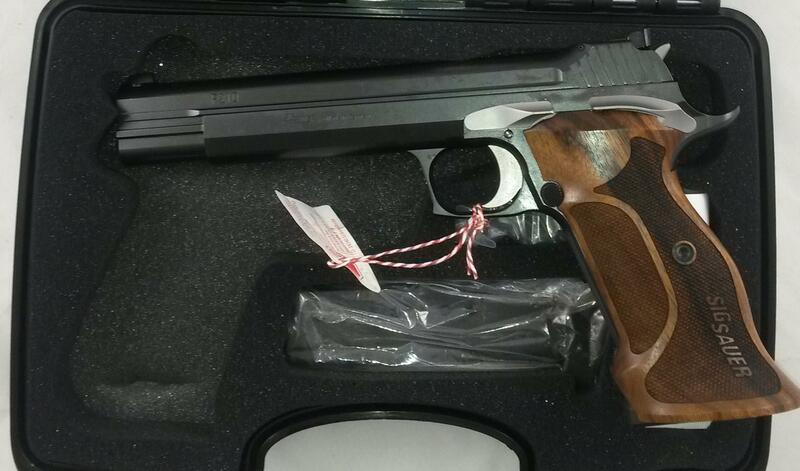 I am offering a brand new Sig Sauer P210 Super Target 9mm pistol finished in silver or black crafted in Germany. Both are in stock. SPECIFICATIONS: *9mm *6" barrel *Stainless Steel lower and slide *SAO *Adjustable rear sight * *(2) 8rd magazines. * Walnut Mastershop extended grips. THE PACKAGE INCLUDES: Pistol, (2) 8rd magazines, test target, manual, sight adjustment tool, lubricant, proper Sig cardboard box and factory plastic case. PRICE:: $4,650.00 for either SILVER or BLACK model. PAYMENT: I accept a USPS Money Order or the following Credit Cards: Discover, MasterCard or Visa. NOTE: There is a 3.0% CC surcharge if you choose to use a credit card. SHIPPING: $30.00. USPS Priority Mail with tracking to your FFL. Shipping insurance is not included. Added Black model to sale.